ევროპული საკონდიტრო “Le Gâteau” დაარსდა 2012 წლის მაისს ქართველი და ებრაელი ინვესტორების მიერ. ეს არის საკონდიტრო, სადაც ყველაზე პრეტენზიული კულინარიული გემოვნების მქონე ადამიანისთვისაც მოიძებნება საყვარელი საკონდიტრო ნაწარმი. 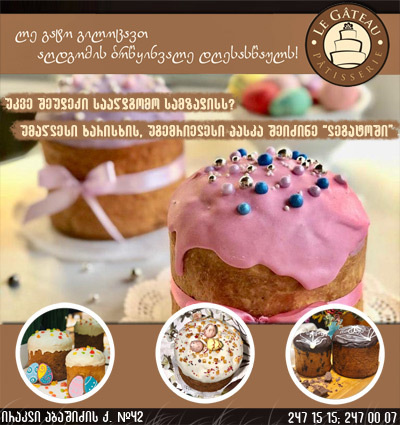 დაარსების პირველივე დღიდან “Le Gâteau”მომხმარებლებს სთავაზობს განსხვავებული ასორტიმენტისა და უმაღლესი ხარისხის, ეკოლოგიურად სუფთა პროდუქციას. კომპანიის საქმიანობის ამოსავალი წერტილი მაღალი ხარისხი და პროდუქციის საუკეთესო საგემოვნო თვისებებია. მიუხედავად არსებობის მცირე პერიოდისა „ლე გატო“-მ შეძლო საკუთარი ნიშის დაკავება. უგემრიელესი ნამცხვრები, ტორტები და დაბალკალორიული პურის ასორტიმენტი "ლე გატო"-ში ნამდვილ კულინარიულ “შედევრებად” არის ქცეული. ჩვენთან თქვენ შეგიძლიათ დააგემოვნოთ ევროპული ტექნოლოგიებით, კლასიკური და უახლესი რეცეპტურით დამზადებული საკონდიტრო ნაწარმი, პურ–ფუნთუშეული, სენდვიჩები და სალათები. ამ ეტაპზე მოქმედებს “ლე გატო“-ს გაერთიანებული საკონდიტრო და კაფე სასიამოვნო და მყუდრო გარემოთი. კომპანია მიმართულია უზრუნველყოს მომხმარებელი ეკოლოგიურად სუფთა, უმაღლესი ხარისხისა და საუკეთესო საგემოვნო თვისებების მქონე პროდუქტებით. კომპანიის მიზანია იყოს მოწინავე და საკუთარი ადგილი დაიკავოს ადგილობრივ საკონდიტრო წარმოებაში. 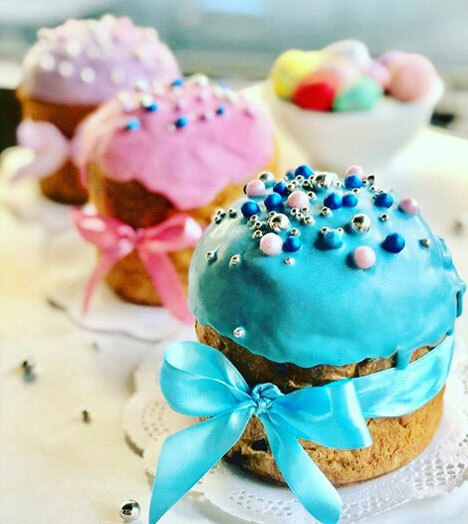 European confectionery “Le Gâteau” was founded in May 2012 by the Georgian and Jewish investors. This is a favourite place for pretentious persons ,who has a great pastry taste.They will discover delicious assortment of culinary arts. “Le Gâteau” offers its customers a variety of high quality and ecologically pure products. Despite of our short -term existence, “Le Gâteau” discovered its niche and successfully positioned itself in the market. Assortment of delicious cakes, pies and low calorie bread has become a culinary Masterpieces. You can taste pastry, bread , sandwich and buns made with European, classic and contemporary technologies. At this stage “LE Gateau” presents united confectionery and a café with pleasant and comfortable atmosphere. Our mission is to provide the highest quality and most environmentally pure products with the best flavoring properties. The company's goal is to be advanced and real leader in the local confectionery market.